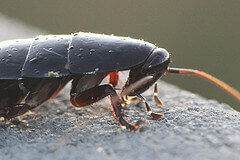 Water bugs, whether you’re talking about a palmetto bug or a common pest cockroach, are a nuisance inside your house. You’re here because you want them gone right? Read on to learn how to get rid of water bugs, and kill them before they get a chance to settle in and multiply. The palmetto bug. Photo credit at bottom. All three of these cockroaches are larger in size compared to the cockroach commonly found to infest homes, the German cockroach. Are Water Bugs Harmful to Humans? Their size can make them seem a lot scarier than they really are. While some people have reported bites from water bugs, they are generally not harmful to humans. The biggest threat they carry is the risk all cockroach pests possess–the potential to spread disease. So why do you have to deal with them? What are they attracted to, and what is your home providing, that is causing them to come around? The palmetto bug (Florida woods cockroach) is usually an outside pest. They don’t enter your home with the idea of living there permanently. American cockroaches and Oriental cockroaches are different. They’ll settle in if the conditions are right. What do all three of them come looking for in the first place? Water bugs are attracted to easy sources of food and water. Because of their search for food, you’ll often find them near the garbage bins outside. In their search, they often make their way into your home. Once inside, they will usually find what they’re looking for, so they stick around. It doesn’t matter which cockroach you are dealing with specifically. You can kill them all using the same methods. What kills waterbugs? All of the methods I list below will get the job done. Boric acid and borax are effective natural solutions. They’re similar, but they are not the same thing. Since their effects on roaches and application are almost identical, I like to lump these two together. You can read more about how to use both boric acid and borax in my other posts. If you choose to use either of these two, don’t forget to read my article about common mistakes to avoid when using them. It’s very important that you use them correctly. If you don’t, they won’t work very well. Roach baits are the easiest to use and are the most convenient. They come in various forms, but the two I like most and recommend are the roach motels and the roach gels. The gel is great for high places, along walls & baseboards and even under the cabinets. The best roach bait gel I’ve used is the Advion Syngenta Cockraoch Gel Bait. Further discussion of why I love it so much can be found be found on this page. Roach motels are great to place under the cabinets and fridge. Advion bait stations are the most effective bait stations, a.k.a roach motels, I’ve come across. Any of the other spots covered in my roach traps post are good locations to use baits. You can also use a roach spray. One from your local mega store will be sufficient, but I really recommend mixing something more concentrated like Demon WP (the stuff used by professionals) and spraying it with a dedicated sprayer. I already have a post that goes more in depth about how to use Demon WP for maximum results, so be sure to check that out too. Just read the label and make sure the active ingredient is cypermethrin. Spray along the baseboards and areas where you’ve seen roaches. Be careful not to spray on surfaces where food will come into contact with it. Those water bugs would be a lot easier to deal with if there were less of them. It will help to prevent more of them from entering your house. Seal up any cracks and openings with caulk. Spraying outside like I said above with a roach spray also helps. Stopping more from coming in and killing the water bugs already in your house is what it’s going to take to get rid them. Now that you know how to get rid of water bugs, don’t wait around and give them a chance to settle in. Take the steps above and eliminate them quickly.